If I took you to this beach in St. Thomas and we walked along for a bit you certainly wouldn’t believe me if I told you that it is one of the less frequented beaches on the Island. But it shouldn’t be. The sand is fine and there are some very good shade spots on the beach. Plus, if you get adventuresome, there is some pretty good snorkeling along the left shoreline out to the point. There are rocks here and you just have to use a little common sense to know when it is calm and safe to go out. But there are a lot of fish to be seen and some nice coral, too. If you’re into diving, this might not be the best beach to dive from, but then again, there are more dive sites around St. Thomas than you can shake a stick at. Welcome to Bluebeard’s Beach. 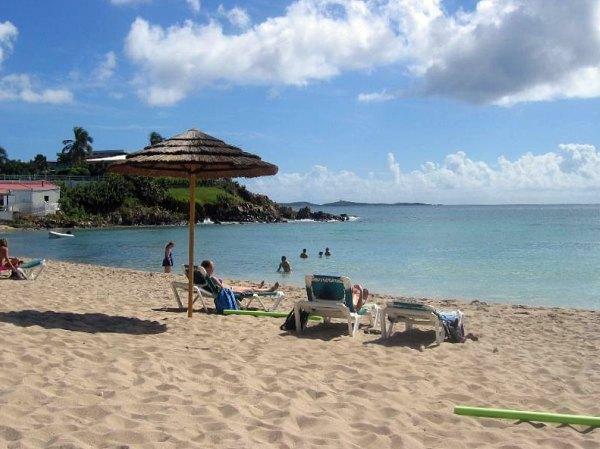 In charming Vessup Bay, Bluebeard’s Beach is another classic white sand strand. And you’ll want to visit because this is historic as well as relaxing. 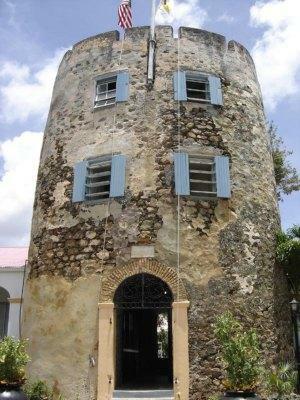 Though now a resort, Bluebeard’s Castle, or what’s left of the fortress, dates back to the 1600’s. It is said that Bluebeard, the infamous pirate, constructed his lookout on the hilltop overlooking the harbor (present Charlotte Amalie), so he could see when prospective ships were arriving, or sailing by. The view from the “castle” is spectacular. But it’s not near the beach. Bluebeard also has a beach named after him. The beach is located not far from the town of Red Hook (think Deep-Sea Fishing), and is postcard perfect. As you venture down Bluebeard’s Road (Rte. 322), follow it down as it leaves Route 30. Behind the beach are rocky hills and semi-arid vegetation like cactus and agave plants. Of course the sea grape trees are everywhere. There are water sports available right up in the bay and tons of room for you to stretch out and call your own, because – not many know of this beach! It can be hard to find and if you get a little lost, let me tell you that any beach in the area will be awesome. You can find many just by following local signs or heading toward the water and finding parking at the end of a street. Hop out – look around; the beach might be outstanding and you have a day at the beach. Or you can just pick up your bag and go for a long, long walk along the shoreline. A little bit of everything here, for you. Enjoy. Facilities – full service nearby. Shade – palms and beach huts. Sports – rentals available right at the beach. Notes – off the beaten path and very nice!